As below, the deadline for contest entries has been extended until February 7, 2019. 8- Entries my be submitted from now until February 7, 2019. Please remember to do your holiday shopping at B&H using a BAA affiliate link or by clicking here or on any B&H affiliate banner here on the blog. ps: There is no problem using your Prime account; just click on one of our Amazon links and log into your Prime account if it does not pop up immediately. I still need three or four folks for the Galapagos trip and two more for the Spoonbill IPT. If you would like to explore the possibilities, please get in touch via e-mail. For the Galapagos trip, no reasonable offer will be turned down. 2019 San Diego 4 1/2-DAY BIRDS AS ART Instructional Photo-Tour (IPT) SUN JAN 20, 2019 thru and including the morning session on THURS JAN 24: 4 1/2 days: $2099. (Limit: 10/Openings: 4) Introductory Meet and Greet at 7:00pm on the evening before the IPT begins: SAT DEC 19, 2019. Selling your used (or like-new) photo gear through the BAA Blog is a great idea. We charge only a 5% commission. One of the more popular used gear for sale sites charged a minimum of 20%. Plus assorted fees! Yikes. They went out of business. And e-Bay fees are now up to 13%. The minimum item price here is $500 (or less for a $25 fee). If you are interested please scroll down here or shoot us an e-mail with the words Items for Sale Info Request cut and pasted into the Subject line :). Stuff that is priced fairly — I offer pricing advice to those who agree to the terms — usually sells in no time flat. Over the past year, we have sold many dozens of items. Do know that prices on most everything dSLR are dropping steadily. You can always see the current listings by clicking here or on the Used Photo Gear tab on the orange-yellow menu bar near the top of each blog post page. Having quickly and completely fallen in love with my much more expensive Nikon AF-S NIKKOR 500mm f/5.6E PF ED VR lens, I am offering my Nikon 200-500mm f/5.6 lens in pretty close to near-mint condition for only $1199.00 (was $1299.00). The sale includes the original product box and everything that came in it, the crappy original tripod collar, the RRS Collar Foot Package for Nikon AF-S 200-500mm f/5.6E ED VR Lens (a $250 plus the shipping) value, and insured ground shipping via UPS. Please contact me via e-mail or on my cell at 863-221-2372 (before next Wednesday, 19 DEC). This image was created on January 11, 2019 at Volunteer Point, the Falklands. I used the Induro GIT 204/Mongoose M3.6-mounted Nikon AF-S NIKKOR 500mm f/5.6E PF ED VR lens and my souped up Nikon D850. ISO 400. Matrix metering plus about 1/3rd stop: 1/2500 sec. at f/6.3 NATURAL AUTO WB at 5:13am with some light clouds on the horizon. One up and one to the right of the center Group (grp) AF point/Continuous (C in Nikon/AI Servo with Canon) AF was active at the moment of exposure. 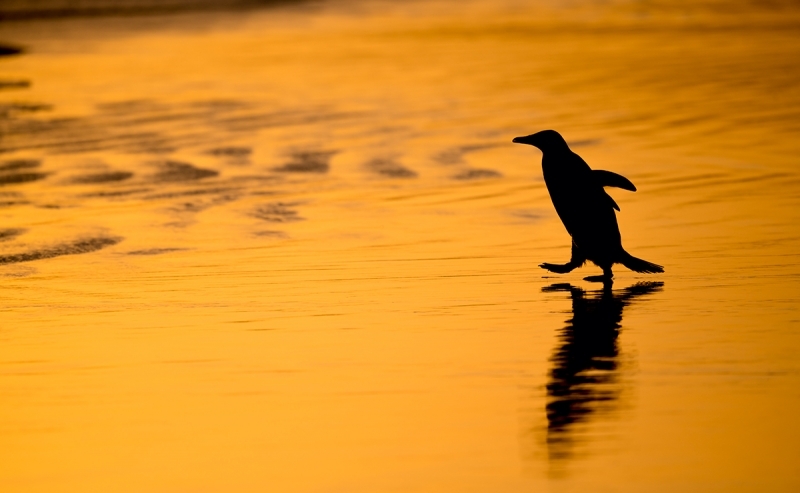 The array was on the penguin’s upper body. The trick here to to focus in such a manner that you have included the complete reflection. 1-You can often find situations where you can put yourself in position to take advantage of nice sky color. 2-Birds and wildlife are often more active at dawn than at any other time of day. On some of the islands we got out really early, came back to be served breakfast at a “normal” hour, and, if it was not full sun, headed back out for a few more hours. At some point we had time for long naps, image review sessions, Photoshop sessions, and even a formal instructional program or two. The it was back out between 3:30 and 5pm depending on the sky conditions. Sometimes we made it back in time for dinner, and sometimes we ate cold food. On our two visits to Saunders Island we self-catered and were thus free to set our own schedules and eat whenever we wanted to. All in all the days were long and we would put in eight to ten hours of more in the field and still have lots of time for napping and the rest. Of our close to forty photo sessions I opted to stay in on only twice. We walked more at Volunteer Point than at any other location as it was more than a mile to get to the King Penguin colony. I almost always took the longer beach route because I love beaches so much. On the morning of January 11th, getting out early and heading down to the beach paid off handsomely. I am look forward to getting out early and staying out late on the San Diego IPT. Are you an early riser or do you like to sleep late? 1 comment to The Advantages of Getting Up Early. Contest Deadline Extended. Hi, Artie. I hate getting out of be early and it takes me a long time to wake up. But I always do get up early for good photography for all the reasons you give, and I seldom if ever regret it. I envy you because getting up early comes easy to you!